Self cleaning litter boxes self-clean in a variety of different ways. While some of them require electricity, others take a more manual, electricity-free approach. They also have different requirements in kitty litter: Some need regular clumping kitty litter, while others use their own, special granules. 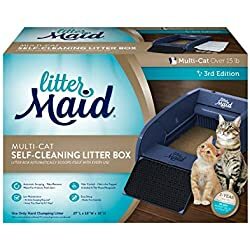 Below are self cleaning litter boxes for sale on Amazon and eBay. 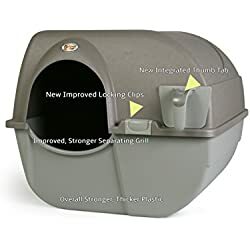 For more information about self cleaning litter boxes please scroll down beneath the items for sale. 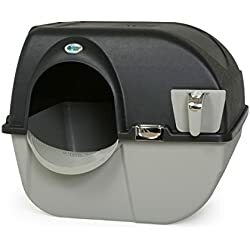 Below is a brief description of a few common styles of self cleaning litter boxes and specialty items they do, or don’t, require. Requires hook up to water? No. Uses regular clumping cat litter? Yes. 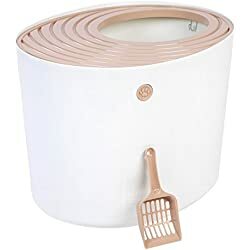 Brief overview: Instead of scooping litter, you roll the Omega Paw to the side so the waste inside sifts itself into a waste tray that you remove and empty. Brief overview: The Litter Robot III automatically rotates itself so the waste inside sifts itself into a waste tray that you remove and empty. It’s expensive, but also gets good reviews and doesn’t require any specialty items. Requires hook up to water? Yes. Uses regular clumping cat litter? No. Requires special washable granules instead. Other: Requires special SaniSolution. Also requires a drain hose to be drained into the regular (human) toilet bowl. Brief overview: The CatGenie allows liquid waste to drain through the special washable granules into a holding container. It slowly spins to scoop out solid waste then removes it to a waste tray where it is liquified. 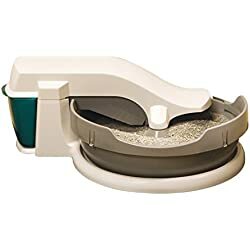 It also slowly spins to clean the washable granules and the inside of the CatGenie bowl. The liquified solid waste, water (used for cleaning) and SaniSolution are drained into the regular (human) toilet bowl. Uses regular clumping cat litter? No. Requires special, disposable trays with litter-like granules instead. Brief overview: Uses a raking motion to rake waste into a trap. 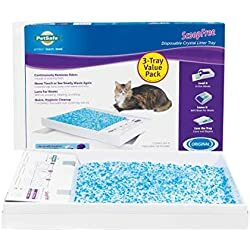 Below are a few good things to know before buying a self cleaning litter box. What, exactly, makes the litter box self cleaning? 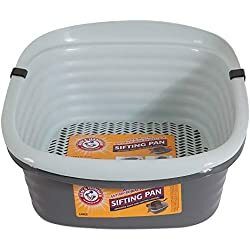 In general, the term “self cleaning” when applied to a litter box usually implies that hand scooping individual clumps of waste won’t be necessary. However, self cleaning litter boxes vary greatly and the term can mean pretty much anything. How, exactly, does the litter box self-clean? Does it rake, rotate, wash, use a conveyer system, or something else? When it’s done, where does the waste go? Does it require electricity? 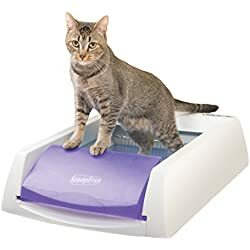 Many self cleaning litter boxes do, but at least one, the Omega Paw, is totally manual. Does it require being hooked up to a water supply? Many don’t, but, for example, the CatGenie does. How big is it? 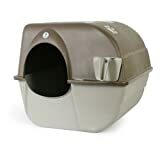 Many self cleaning litter boxes require more room than conventional styles of litter boxes. Of course, the tradeoff is usually worth it if you have the space, just make sure you know how much room it will take up and if you have a convenient place to put it. 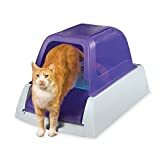 Will the self cleaning litter box accommodate the size of your cat? Will it require special accessories? 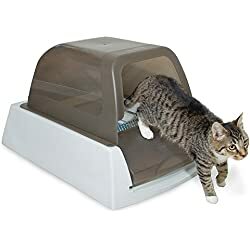 Some self cleaning litter boxes, like the Litter Robot III Open Air don’t require any special accessories, but others require special litter or other specialty items. Is the cost of shipping included in the price, or will it be extra? How long after you place your order will it be before the item is shipped? Some might ship right away – even the same day you place your order – while with others there might be a delay. Will the seller accept returns? If you return the self cleaning litter box will there be a restocking fee? How long do you have to return it? If the seller accepts returns, who pays for the return shipping? Hint: It’s usually you, the buyer, that pays return shipping costs.